Yurts and Genetics: who’s your daddy? - Jason Alter Ph.D.
You may not know it, but Yurts are part of your history and Genghis Khan may be your great, great granddaddy! Let me take a step back and explain how this strange confluence of history, vacation, and genetics came together. Recently, we took a wonderful vacation at The Treebones Resort in Big Sur, California. Treebones consists of sixteen yurts, a tree house, Twig Hut and something called the Human Nest – more on that in a moment. Now I had never been to either Treebones nor Big Sur, and I have to tell you, if you get the opportunity to visit Treebones specifically or Big Sur in general – do it. 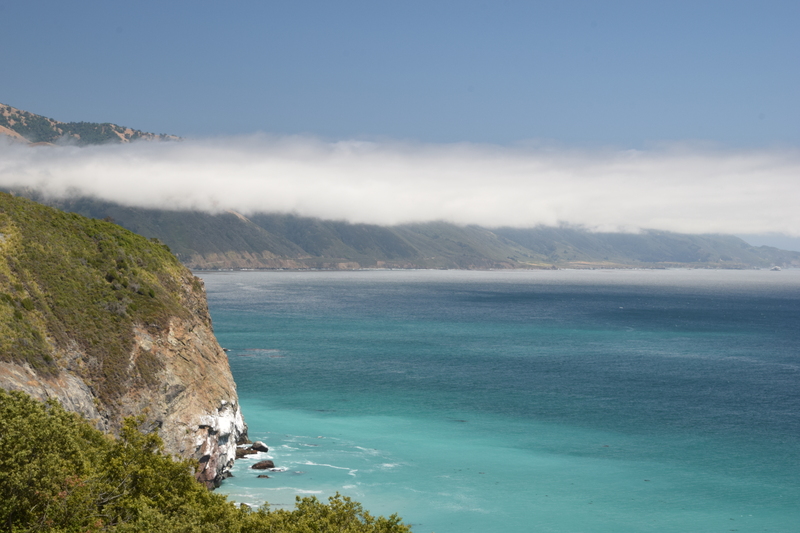 Big Sur is a vast, seemingly empty wilderness on the Pacific coast in Central California. It has incredible hiking trails, spectacular views and you would never suspect that you are in one of the most populous states in the union. I’ll have to do a separate post just on Big Sur! Treebones is glamping. Now my daughter tells me it’s ‘glamping’ when we have our annual camping trip and stay in a tent in Anza Borrego. But that isn’t glamping: we pitch out tents, cook our own food and anytime I have to cross a quarter mile of a desert to get to the bathroom, it’s just not glamping -ok? But Treebones is absolutely the definition of glamping, and it’s glorious. The ‘resort’ is pitched on the side of a hill overlooking the Pacific Ocean. I don’t have to cook my own food, the modern bathroom is fifty feet away, but it is the yurts that define the experience. There are sixteen yurts. 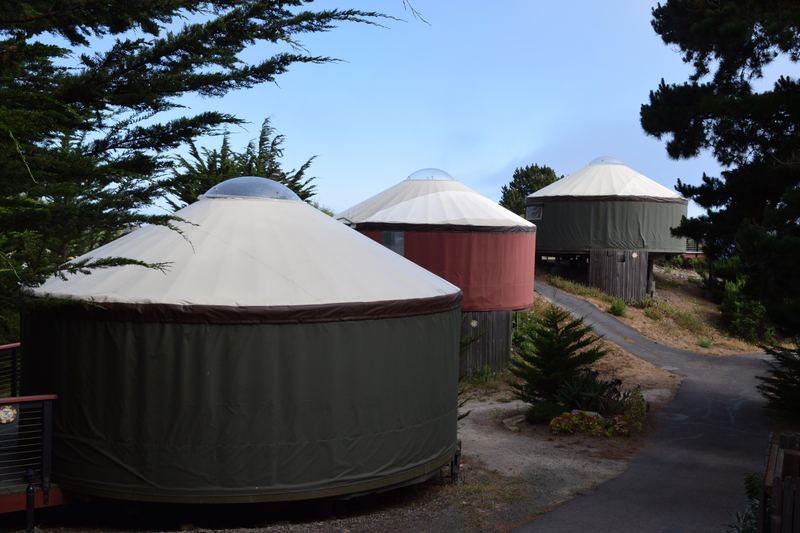 These yurts are circular, permanent structures that have polished wooden floors, comfortable beds, skylights, and furniture. Each yurt has electricity, lights and a gas-fired stove. They each have a sink, so I don’t have to leave the yurt to brush my teeth in the morning. It’s just about as different from pitching a tent as you can get. In addition to the yurts, the Human Nest is the most different, certainly the most photographed part of the resort. The Human Nest is a big bird’s test for people. It is completely exposed to the elements and was designed and built by a local Big Sur artist – Jayson Fann. Pretty much the only thing is the nest is a futon pad, so bring your sleeping bags and warm clothing. You’ll have to leave your suitcase at the base of the tree before you climb the latter to your woody perch over the Pacific. When you have breakfast in the lodge, you can always tell who stayed in the Nest the night before: they’ll be the tired and rumpled looking folks who braved the elements to sleep in a human-sized bird’s nest. So how does any of this relate to Genghis Kahn and the Mongol Horde? Well, I was surprised to find that in 2003, a ground-breaking study presented data that demonstrated that a large number of Earth’s male population (1:200) are direct descendants of Genghis Kahn. Approximately one in every two hundred men can claim to be a direct line descendant of the Genghis Kahn. The study showed that these men carry Y chromosomes which seem to have come down from a man who lived approximately 1,000 years ago (Genghis Khan died ~750 years ago). As Y chromosomes are only passed from father to son; the Y chromosome is a record of each son’s lineage (on their father’s side). The Mongols have been called a land version of the Vikings and based on the history books, it seems to be an appropriate description. Genghis Khan (Chinggis Khan) led the Mongols and forged them into a united fearsome offensive army. They used horses instead of ships and conquered much of Eurasia, The Mongol’s Empire extended from Poland to the Korean peninsula and from Siberia the Arabian peninsula: approximately 12 million square miles. In fact, during my research I found the Mongols to be so compelling that Genghis Khan and the Mongols will be one of the stops in the next John Fastramp book: John Fastramp and the Race Through Time. Yurts are three thousand years old and are called gers in Mongolia (ger means home in Mongolian) and more than half of today’s Mongolians live in gers or yurts (Turkish). Mongols from Siberia claim their land the birthplace of the Mongol tribes and the yurt. Originally, yurts were made from felt. Boiled lamb was an essential part of the Mongol diet, and wool and animal skins were a byproduct. The Mongols pressed the wool into felt and used it in clothing blankets or the outer covering of their yurts. As the Mongols spread across the continent, yurts spread with them. Nomadic tribes moved from spot to spot at least several times a year, and they liked yurts because they were easy to transport, could be put up quickly, and were wind resistant: the wind blows hard on the steppe, but since yurts are around, it doesn’t matter which way the wind blows. Now, I didn’t really know most of this when I stayed in the yurts at Treebones. But, in hindsight, it’s nice to know that Treebones is not only a very relaxing place for a vacation, but it is also steeped (yes it’s a bad pun) in history.